David “Dave” P. Hrabe, PhD, RN, NC-BC has over four decades' experience as a nurse, consultant, and educator. 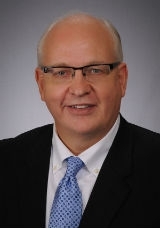 At The Ohio State University College of Nursing, Dr. Hrabe serves as associate professor of clinical nursing and executive director, Academic Innovations and Partnerships, where he teaches courses on leadership in advanced practice nursing, professional development, evidence-based practice and health coaching. He heads a health program for university employees, “Health Athlete” which focuses on self-care. He is a certified Nurse Coach and passionate about developing the next generation of nurses and healthcare team leaders to work more effectively by communicating clearly and taking better care of themselves and each other. He is a long-time member of the American Nurses Association and the Arizona Nurses Association where he currently serves on the Board of Directors. He received his PhD in nursing from University of Arizona, his MS from Arizona State University and his BSN from Fort Hays State University.